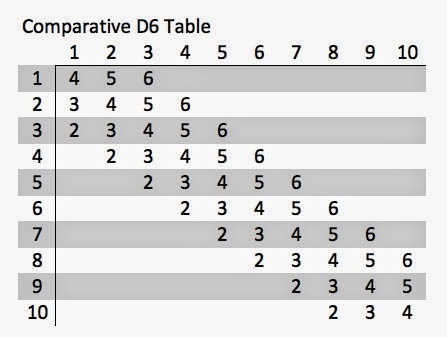 Last year, we talked about the pros and cons of sticking with D6 dice for the game vs. adopting D10. But I've had some additional thoughts on the matter. A lot of the new miniature games, such as Wild West Exodus, are using D10s. As a result, my own FLGS is now offering inexpensive 10-die multi-packs. Whereas a year ago you could only buy D10s singly, or in rollplaying packs with D4s, D8s, D12s, and D20s. 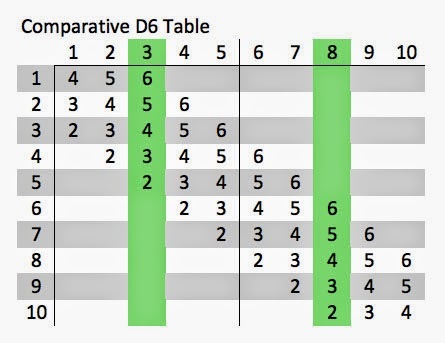 While that doesn't totally negate the familiarity and availability arguments in favor of D6, it does perhaps warrant a re-examination of the pros and cons of D6 vs. D10. When you ask the average person what a "die" is, they'll instantly think of a D6. 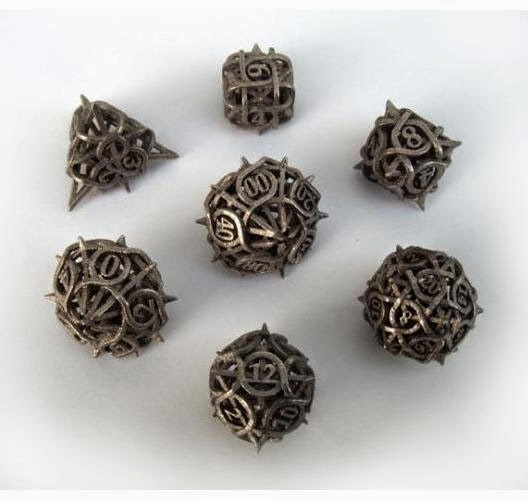 If you were to rummage through the game closet of an average house, you're very likely to turn up 10-20 six-sided dice. But unless that family plays D&D or something else without "Milton Bradley" on the side of it, then your chances of finding even one "non-standard" die in their collection drops pretty fast. The above is a pic I took of my new Chessix D10's, along with an equal number of D6 dice. There's just no way around it. The D6 dice are more easily read in large numbers. For a dice game where you may routinely throw 20 dice down, that's pretty important. In fact, I'd go so far as to say that any throw over 10 dice for a D10 system is going to cause more headaches for the player reading them than the advantages are worth. 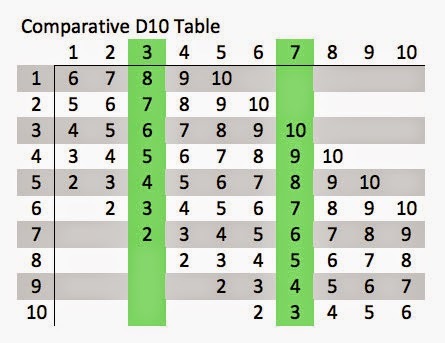 If we were to switch to D10, we would probably have to modify our game mechanics so that players wouldn't have to throw more than 10 dice maximum for a particular attack. I still think that all of that is true. But now we get to what I think is the strongest argument for using D10s. On the left is whatever your WS or Armor value is, on the top is whatever your Evasion or Armor Penetration Value is. In between you can see the useful range of results for each combination. This is much like 40K's toughness test, except that GW extends the upper range a bit with an additional row of 6's. Some games, like Bolt Action, extend the range with another roll. Requiring you to roll an additional 2+, 3+, 4+, etc. in order to add more granularity to the range. 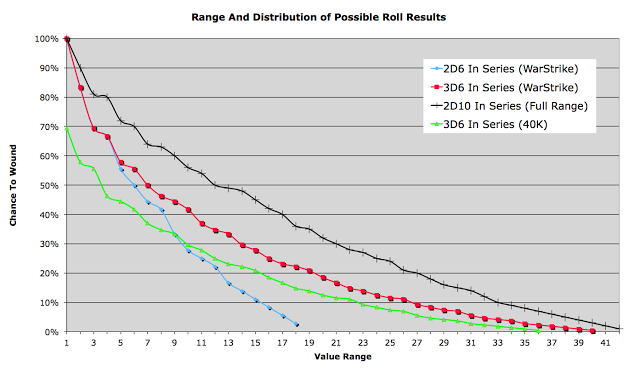 Extra rolls aside though, you can see that for an identical WS/Ar vs. Ev/AP, there's only 2 levels of 'better' or 'worse' available for things like terrain to-hit modifiers. Add in a difference of two points between the compared stats, and being slightly hidden by cover is enough to make a shot impossible instead of just harder. Which means that (as has happened in 40K) the stats of the models in the game are likely to get constricted within a narrow 3-4 point range. Ever see a BS6 or 7 model in 40K? Does any toughness above 5 matter, except for instant-death purposes? Exactly. Then there's the question of balancing the stats that feed the comparative chart. Conceptually, we've discussed giving infantry models an average BS/Ev of 8, and tanks/vehicles an average BS/Ev of 4. Which achieves the goal of making infantry harder to hit by vehicles without interfering with infantry's ability to hit other infantry. The odds of any given Evasion being hit by these standard Ballistic Skills could then be calculated, and the results would determine what benefit a model would gain versus infantry and tanks. The problem is that in a D6 system, your average infantryman would then be un-hittable by an average tank in the open. While your average infantryman would be able to hit an average tank automatically, even if it had an extra 2 points of Evasion from cover. That's too wide of a difference. We could reduce the average infantryman to a BS/Ev of 6, allowing cover to matter for a tank. But the average infantryman would still be un-hittable by an average tank without some sort of close-range bonus. So that pushes us down to an average BS/Ev of 5 for infantry. Which severely limits our variety. If we bring the human average down 2 points to Ev5, then Knights and Paladins would have to share Ev4. While Sentinel/Drednought-sized walkers and Tanks would have to share Ev3. Meh. 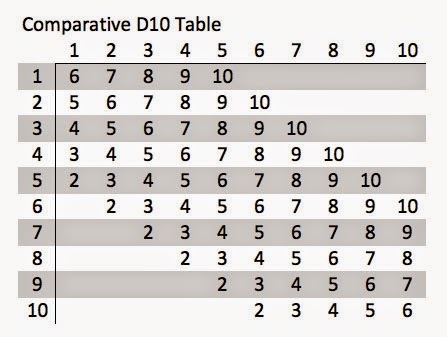 Moving to a D10 instead would double the better/worse range from +/- 2 points to +/- 4 points. An average tank would then have a 1 in 10 chance of hitting an average infantryman in the open. Though practicality might call for either reducing the average infantry evasion to 6, or giving a +1 bonus for close range shots. D6 is still a safer way to go. But the gaming environment right now isn't the same as it was 2 years ago. Players seem comfortable enough with different dice these days (esp. those I've tested the game with), so the only real sticking point is availability. 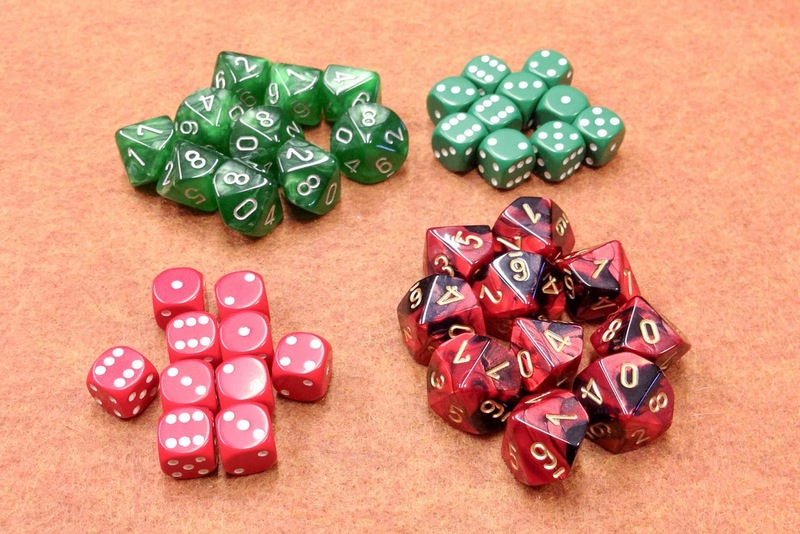 How many people would buy 1-2 packs of ten D10 dice (for $14 each) just to try out our game? Is it worth losing X percentage of potential players for the sake of having a system with more variety/granularity than we have now? I've still got a lot on my plate with my parents (cancer treatments, broken bones, selling of houses, etc.). But I've finally nailed the root cause of the weird neurological problems that I've been having. Seems I'm extra-sensitive to Glutamate. Not just the food additives, like MSG or 'Natural Flavors', but the natural Glutamate that's highly concentrated in cheeses and various nuts. Avoiding these foods has cleared my head, stopped the strange muscle twitches/pains, and massively increased my energy. As a result, I'm getting work done on the rules again. So expect to see the completed movement section next week.